Last Wednesday I was invited as a "Friends of Kiehl's" and attended the Launch of Kiehl's Ultra Facial Overnight Hydrating Masque at Mid Valley Kuala Lumpur! If you're wondering what a "Friends of Kiehl's" is, its actually a loyalty club. Well all you need to do is spend RM 250 and above in a single receipt to be able to join and its a lifetime membership. 1. If you accumulate a total of RM 1000 nett within 12 months from the date of your first purchase you will then be eligible to redeem a RM 100 gift certificate. You can log in by clicking this link to check how much points you have accumulated or if you are eligible for the RM100 gift certificate. 3. Exclusive invitations to launch parties, workshops and pre-launch samplings. And you guessed it I got invited to this launch through this last benefit! Yay me! Super informative and friendly staff, Love them! My life saver! Love you guys for always bringing me the food! 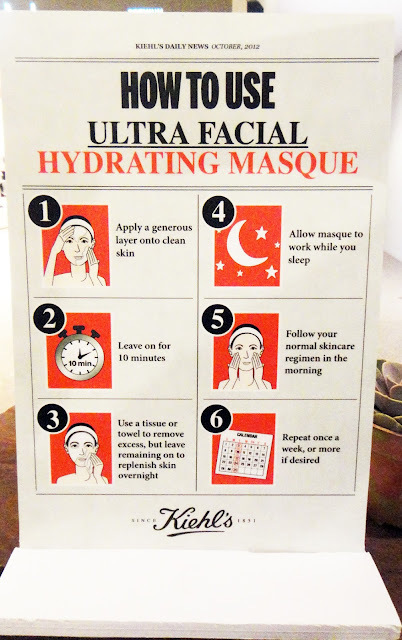 Now your wondering what the launch product actually does well the Kiehl's Ultra Facial Overnight Hydrating Masque is a concentrated masque that replenishes the skin's water reserves, provides a long lasting hydration and you can use it overnight while you sleep! It's advertised ingredients include the fountain plant which is native to Asia as this plant limits excessive water to keep skin optimally moisturized, it contains pro-hydration actives which helps skin retian water by strengthening skin's moisture barrier and it contains fragmented hyaluronic acid in small particle size which better hydrates water reserves in the skin. The masque texture is clear and slightly tacky. The amount/thickness that should be spread out on your face to achieve the best result and leave on for 10 minutes. I used a tissue to wipe off the excess. This is what it should look like after. Leave this on until the next morning when you wash your face and you're done. Pros: Your face feels really plump and hydrated the next morning and after using it twice I still haven broken out in pimples after using the mask. Cons: Only use this if you can stand the fact that your face will be slightly tacky (sticky) until you wash it off the next morning. The Aromatic Blends consist of 4 wonderfully delicious scents that come in the form of a body cleanser, body lotion and perfume for each scent! This has a (not overly) sweet scent. Why do I say this? Its because the top note is a bitter orange scent when you first spray it on. After awhile it mellows out to a refreshing orange lychee sweet scent. This on the other hand is a straight out fresh sent. It has a light airy texture without being overly flowery. This has a warm sultry scent, so if you love sensual perfume this is it. If you worry about the scent being vanilla don't! Kiehl's got the scent of vanilla just right without being sickly sweet. Lastly, this has a dominant herbal scent and while its not something that I would personally like (as I love fruity, flowery, woody, warm and sensual scents) . 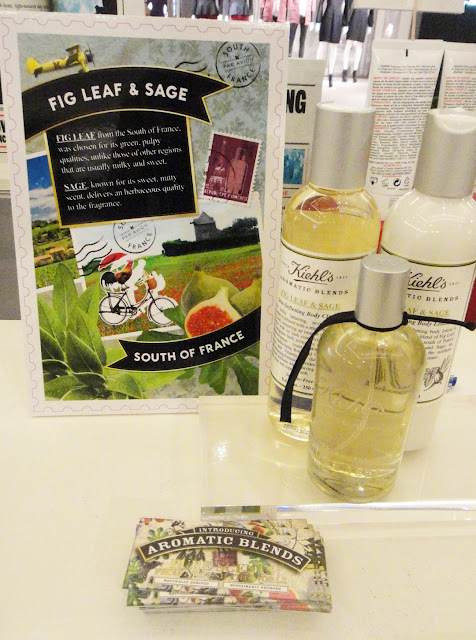 I believe that if you have the tendency to love herbal scents you will surely fall in love with this. If you're dying to try out this scent do not worry its going to be launched on the 1st November 2012 so mark your calendar I know I will. On that note I myself only got the chance to try out the perfume at the launch and they smell heavenly. So I'm waiting for the launch so that I can get to test out the body lotion and the body cleanser. What's so good about the lotion and the cleanser? Well the staff of Kiehl's told me that the body lotion will be silicon-free where as the body cleanser will be sulfate-free. As you know not many brands in Malaysia do that. So fingers crossed they don't disappoint me!